So it's been pretty freaking hot here in the San Diego area so the thought of turning the oven on is a real nightmare, anyone else feel me? I am all about making things quick and easy sans lots of heat. My mom came over Saturday night and 2 bottles of wine later she invited herself back over the next night to make fish tacos...ugh we don't eat fish so I knew I had to veganize her plan. I decided to just do tempeh in place of the fish in the taco, and it was delicious and super easy. What I did was just cut the tempeh in long 1 inch thick strips and lay them in the tortilla just like a battered piece of fish (RIP fishes everywhere, and especially the ones that end up at Rubios). So here is what you need and how to make it! cut your tempeh into long 1 inch thick strips. Place tempeh on a plate ad pour the marinade over the top them flip the tempeh, so that it is completely covered in sauce. Let sit for 10-15 minutes. While tempeh is sitting in sauce chop cabbage, cilantro, and cut your lime into wedges. Heat a pan with 2 tbsp olive oil and throw in the tempeh strips and cook for 10-12 minutes flipping half way through. Heat up your corn tortillas. 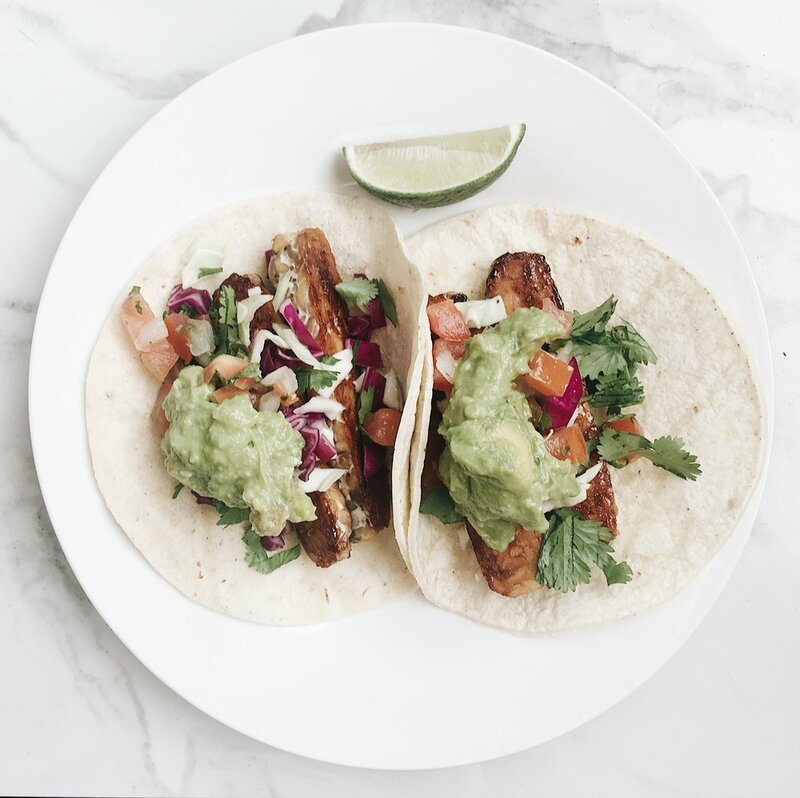 Plate your tacos and garnish with a tbsp of guacamole and salsa fresca. I always squeeze 1 or 2 limes wedges on my tacos, it really gives them that fresh taste.